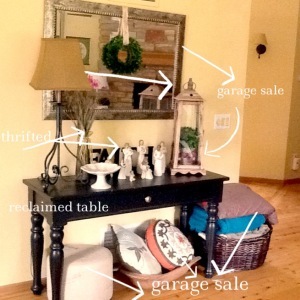 Ever wonder how to decorate with thrift store finds? For me, I have no plan. When I go treasure hunting, I purchase items that speak to me. Honestly they do! They practically jump right out at me. It probably is my style or something that clicks from seeing ideas in a magazine or on a blog. However, if I purchase an item, it doesn’t mean I’ll use it right away. I have had things sit for a year before repurposing them into my space. I have a large storage space in my basement that I can store these finds until the are needed in my decorating process. Do you recall the hutch I added into my space? You can read about it here. I decided I was tired of it. Yup, I sold it. One afternoon, while eating lunch and looking at it, I decided it was time for it to go. I posted it on a locale Facebook sell and swap page and had a bite almost immediately. Seriously, it was gone within two hours!! That’s what I love! Because I buy items for next to nothing, personalize ( or not) I can swap them out when I get tired of them or am inspired by something new. That’s probably what keeps me on the search. Just because I’m in a dry spell, doesn’t mean I will stop hunting. Oh, no no. Quite contra-ire! I love it too much. Until, something new pops up, I have plenty of projects to work to create a thrifty decorated room. Have you hit a dry spell? What do you do when this happens? Please share.